On 4 and 5 August, 1941, German spy Josef Jakobs was brought before a court martial at the Duke of York's Headquarters in Chelsea. The court martial had a panel of "judges" who were high-ranking military officers. It was there job to decide whether Josef was guilty or innocent of the charges brought against him. In addition, there was an Attorney for the Defence (Captain E.V.E. White) and an Attorney for the Prosecution (Major A.A.H. Marlowe). Eric Vincent Ewart White born the fall of 1909 in Lewisham, Greater London. Eric was the eldest child of Bertram Ewart White and his wife Avera Emily Vincent. Bertram and Avera were married in the spring of 1909 in Wandsworth and young Eric was born a scant 6 months later. Bertram was a solicitor and was part of a successful legal practice (Reid Sharman & Co). The young couple made their home in Lewisham, London, residing on Adelaide Road in Brockley. In the early 1930s, Eric received a M.A. from Oxford, Pembroke College. He went on to join the bar of Lincoln's Inn as a barrister-at-law. In 1935, Eric co-wrote a book with Thomas Froude entitle: "The Practice Relating to Debentures; a Handbook of Legal and Practical Knowledge for Directors, Receivers, Secretaries, Accountants and Debenture Holders, with Full Appendix of Forms". 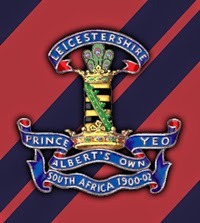 With the outbreak of war, Eric joined the Leicestershire Yeomanry as an officer cadet. He joined one of the Officer Cadet Training Units (OCTU) and learned the skills needed for field artillery. On 19 October, 1940, Eric was commissioned as a 2nd Lieutenant in the 154th (Leicestershire Yeomanry) Field Regiment of the Royal Regiment of Artillery (RA). Less than a year later, on 9 April, 1941, Eric would attend the funeral of his father. Bertram died in the Homeopathic Hospital in London and left his family the rather healthy sum of £6700. By that point, Bertram and his wife had moved to Kingsdown-Road in Epsom. Just a few weeks later, Eric married Nona Lesley Davidson of Sidmouth, Devonshire. The young couple were married in Honiton, Devon. In early August, 1941, Eric, then a Captain, was called upon to serve as defence attorney for German spy, Josef Jakobs. Eric gave it his best shot but in the end, the case for the defence was unsuccessful. Eric's career with the Royal Artillery prospered and by 1942 he was a Temporary Major. In the summer of 1942, word trickled down that Eric's regiment was destined for North Africa. In the early fall of 1942, Eric bid his pregnant wife a tearful goodbye. It was their first child and Eric promised her that he would come home. Eric and his regiment packed their bags, their equipment and headed off to North Africa. In November of that same year, they gave support to the 154th Brigade of the Highland Division. 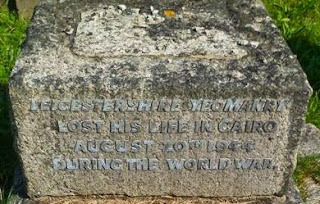 Eric and his regiment may have been involved in one of the battles of El Alamein. In January, 1943, the Eric and the 154th were transferred to Persia for several months before returning to North Africa in April. At some point during those early months of 1943, a letter from his wife caught up with Eric announcing that he was the father of a healthy baby boy named David. Eric and his fellow officers raised a few toasts in celebration of the new life. It seems unlikely that Eric was granted leave to go home. As it would turn out, Eric would never see his son. Over the next few months, Eric served in North Africa, Syria, Palestine and possibly Italy. 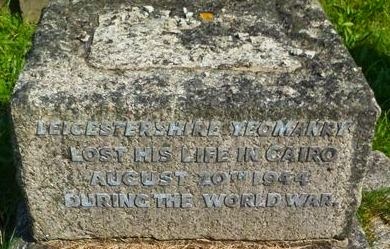 Unfortunately, on 20 August, 1944, Eric was killed in a road accident in Egypt. He was only 35 years old. Eric was buried in the Commonwealth War Cemetery at Heliopolis, a suburb of Cairo in Egypt. 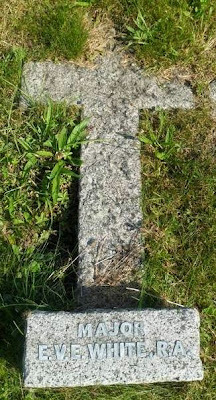 His family erected a monument to him in Epsom Cemetery, southwest of London, in the same plot wherein his father was buried.